Thus is the glory of Peter the Great’s city, St. Petersburg, depicted in the poem The Bronze Horseman by Alexander Pushkin. The Bronze Horseman is also the name of a statue that stands in all its granite glory on Senatskaya Plochad facing the Neva River in St. Petersburg. Created by the famous French sculptor Etienne Maurice Falconet, the statue depicts Peter the Great as a Roman hero. The pedestal is made of a single piece of red granite in the shape of a cliff. From the top of this “cliff” Peter shows the way for Russia as his horse steps on a snake. The snake represents the enemies of Peter and his reforms. Ironically, the “evil” snake also serves as a third point of support for the statue. The St. Petersburg region was originally inhabited by the Swedes. It was conquered by Russia during the Great Northern War (1700-1721) fought between Sweden and a coalition of countries led by Russia. In 1703, Russian tsar Peter the Great chose a site on Zayachy Island in the Neva River and began the construction of the Peter and Paul Fortress named after two patron saints. Although the site was cold, damp, and poorly protected, Peter was determined to build a new capital in the Neva delta to replace Moscow, which had served as Russia’s capital since the origins of the Russian state in the 1300’s. Peter wanted an outlet to the Baltic Sea and intended to make St. Petersburg a modern, Western-style city that would serve as Russia’s “window on Europe.” Although the fortress was originally a primitive earthen structure, stone was brought in when construction of the city began. St. Petersburg was built at great human cost, the Northern Russian climate was very harsh, hunger and cold killed nearly 100,000 people during the first years of its construction. Working from dawn to dusk, they died in great numbers, but the war was on and the fort had to be completed as soon as possible. On May 16, 1703, (May 27 by the modern calendar) St. Petersburg’s fortress (the Peter and Paul Fortress) was founded and that day became the official birthday of the city. Several days later the wooden Cabin of Peter the Great was built and became the first residential building in the new city. A new capital of the Russian Empire was born. The imperial capital — including the Russian court, the Senate, and the foreign embassies — was moved to the new city in 1712. Peter and the rulers after him commissioned Dutch and Italian architects to build the city’s magnificent palaces and churches and an influx of Western scholars and artisans helped make St. Petersburg a cultural as well as a political center. Peter also commanded a new dress code for the nobility modeled after the French court. The Boyars were ordered to shave their long beards. Those caught wearing the old heavy unfashionable dress would have their cloth cut off from the knees down. Originally, there were no bridges crossing the mighty Neva River. People had to be ferried between banks by boat — one of the reasons why St. Petersburg became known as the “Venice of the North.” The city itself consists of 101 islands and is miraculously built on mostly their banks. Today, St. Petersburg has the largest number of bridges of any city in the world, numbering 539 with 315 bridges in the downtown area alone. St. Petersburg is no less of a marvel to visit today. The influx of tourists over the last couple of years has doubled in size. Many visitors say that St. Petersburg is as magnificent as Paris and Venice, that it has an unspoken mystery to it — not entirely European, yet not fully Russian either. One of the many architectural wonders of St. Petersburg is St. Isaac’s Cathedral — one of the world’s most beautiful churches. St. Isaac’s Cathedral was originally the city’s main church and the largest cathedral in Russia. The French-born architect Auguste Montferrend built St. Isaac’s between 1818 and 1858 and expected it to be one of the most impressive landmarks of the Russian Imperial capital. One hundred and eighty years later the gilded dome of St. Isaac’s still dominates the skyline of St. Petersburg. The cathedral’s facades are decorated with sculptures and massive granite columns (made of single pieces of red granite), while the interior is adorned with incredibly detailed mosaic icons, paintings, and columns made of malachite and lapis lazuli. A large, brightly colored stained glass window of the “Resurrected Christ” takes pride of place inside the main altar. The church, designed to accommodate 14,000 standing worshipers, was closed in the early 1930’s and reopened as a museum. Today, church services are held only on major ecclesiastical occasions. Going up 300 steps to the cathedral’s colonnade you will be greeted by a breathtaking panoramic view of the city. Another magnificent church in St. Petersburg is the Church of the Resurrection of Jesus Christ, commonly referred to as The Savior on the Blood Cathedral (1883-1907). The church took the latter name as a memorial to Emperor Alexander II who was assassinated on March 1, 1881 on the spot where the church now stands. Alexander II was the first Tsar to give the Russian peasants their freedom and prepared the nation for democratic constitutional rule. Designed by architect Alfred Parland in the style of 16th and 17th century Russian churches, the Savior on the Blood Cathedral offers an amazing contrast to the Baroque, Classical, and Modernist styles predominant in the Northern Capital. Its unique decorations include icons and panels made from majolica, and mosaics that were created from drawings by the leading Russian artists of the day. Restorers say the church contains more mosaics than any other church in the world. Many famous Russian architects took part in the competition to build the symbolically important church. Alexander III, the heir to the throne, was unsatisfied with their proposals. He wanted the church to be in the style of Russian churches of the 16th and 17th centuries. Indeed, the church’s final composition borrowed heavily from the architectural forms of St. Basil’s Cathedral in Moscow and the Vladimir Cathedral in Kiev. The project was estimated to cost 3.6 million rubles, but ended up costing 4.6 million rubles, mainly from the extravagant collection of mosaics. The interior of the church was faced with Italian multi-colored marble and colored stone from different regions of Russia including Ural jasper, porphyry, violet gray Altai jasper, and dark red, pink, and green marble. One of the most impressive elements of the church is the extravagant shrine, which was constructed on the very spot where Alexander II was fatally wounded, and maintained a special place within the church’s interior. It was constructed according to Parland’s drawing, and completed in July 1907. Four columns of violet gray jasper serve as the base of the shrine. Above, small rectangular columns unite the carved stone awning and the mosaic icons decorated with images of the protectors of Alexander II’s family — the Romanovs. The columns are supported by a frieze, a cornice, and a stone-carved pediment with vases of jasper along the corners. The shrine concludes with a high octahedral pyramid — the cross is completed with 112 pieces of topaz. The frame inside the shrine was faced with a magnificently colored lazurite. In fact, the facing of the arch required more than 100 pounds of lazurite. The arch itself was inlaid with stars made from Siberian semiprecious stones and pieces of topaz. The intricately decorated outside walls of the church rival the magnificence of the church’s interior. The entrances to the cathedral are located at the north and south ends, and was built like closed porches on granite columns. On the place where the main entrance is usually located in churches, the crucifix was arranged on the facade, according to the design of Nesterov. The pediments of each of the four porches of the cathedral are decorated in mosaic panels, based on the gospel scenes according to Vasnetsov: “Executing of the Cross,” “Crucifixion,” “Removing from the Cross,” and “Descending into Hell.” All four mosaic panels are magnificent in their composition and colors. The revolution took a terrible toll on the Church. In 1923, the church became an official cathedral, but this didn’t save it from the barbarian looting of church valuables that took place along with the destruction of the interior of the church. The church was closed by Stalin in 1932 and essentially turned into a garbage dump. Rumors abounded that the church would be torn down. The church also suffered considerable damage during World War II. One German rocket soared through a window of the central cupola and exploded on the floor causing serious damage to the interior. After World War II, the church was used as a warehouse for the Small Opera Theatre. The valuable shrine was almost completely destroyed. Four jasper columns with mosaic mountings on them, and a part of the balustrade, were all that remained. On July 20, 1970 the church was made a branch of the St. Isaac’s Cathedral museum, and eighty percent of the church’s extraordinary restoration was funded by profits from St. Isaac’s. The decades of deterioration and then restoration culminated in the dramatic re-opening of the church in August 1997, when thousands of eager visitors swamped the church in all its newly restored glory. From the 1760’s onwards the Winter Palace was the main residence of the Russian Tsars. Magnificently located on the bank of the Neva River, this Baroque-style palace is definitely one of the main attractions in St. Petersburg. Many visitors also know it as the main building of the Hermitage Museum. The green and white three-story palace is a marvel of Baroque architecture and boasts 1,786 doors, 1,945 windows and 1,057 elegantly and lavishly decorated halls and rooms, many of which are open to the public. The Winter Palace was built between 1754 and 1762 for Empress Elizabeth, the daughter of Peter the Great. Unfortunately, Elizabeth died before the palace’s completion and only Catherine the Great and her successors were able to enjoy the sumptuous interiors of Elizabeth’s home. Some of the best Russian and most famous foreign architects worked exhaustively to ensure that this Imperial residence was one of the finest and most luxurious palaces in the world. Many of the palace’s impressive interiors have been remodeled since then, particularly after 1837, when a huge fire destroyed most of the building. Today, the Winter Palace, together with four more buildings arranged side by side along the river embankment, houses the extensive collections of the Hermitage. The Hermitage Museum is the largest art gallery in Russia and is among the largest and most respected art museums in the world. The museum was founded in 1764 when Catherine the Great purchased a collection of 255 paintings from the German city of Berlin. Today, the Hermitage boasts over 2.7 million exhibits and displays a diverse range of art and artifacts from all over the world and throughout history (from Ancient Egypt to the early 20th century Europe). The Hermitage’s collections include works by Leonardo da Vinci, Michelangelo, Raphael, Titian, a unique collection of Rembrandts and Rubens, many French Impressionist works by Renoir, Cezanne, Manet, Monet, Pissarro, numerous canvasses by Van Gogh, Matisse, Gaugin, and several sculptures by Rodin. The experts say that if you were to spend a minute looking at each exhibit on display in the Hermitage, you would need 11 years before you had seen them all. A guided tour of the museum would probably be less time consuming. Although just 300 years old, St. Petersburg has a rich and decadent history full of dramatic events and major historical figures. Today, the city is a vibrant cultural epicenter and home to some of the most beautiful architecture in Europe. From the early days of Peter the Great’s “Venice of the North” to the modern events of the 1991 coup d’etat, the city has always bustled with life and intrigue, revolution and mystery. Whether you choose to visit the city in the midst of a romantic and snowy Russian winter or during the dazzling White Nights of the summer, for those interested in culture and history St. Petersburg is the perfect destination. Peter and Paul Fortress – Commonly referred to as the “Russian Bastille,” the Peter and Paul Fortress is the first and oldest structure in St. Petersburg. The cathedral, with its magnificent Golden Spire (212 meters long) contains the vaults of Peter I and other Russian emperors, including the Romanovs. 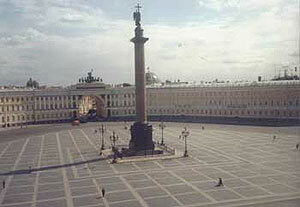 Palace Square – The Palace Square is surrounded by the walls of the Winter Palace and the Hermitage Museum. The magnificent 155-foot-tall Alexander Column adorns the very center of the square. Isaac Square – The Isaac Square got its name from the St. Isaac’s Cathedral which is located in its center and is undoubtedly one of the finest architectural masterpieces of the 19th century. Decembrists Square – The Decembrists Square was named after the first revolutionists in Russian history, who rose against the tsarist regime in December of 1825. Arts Square – Arts Square got its name from the many museums and concert halls that adorn it. The Russian Museum, located on the square, is home to the world’s largest collection of Russian art. Church on Spilled Blood – This breathtaking cathedral was built as a memorial on the exact site where Tsar Alexander II was fatally wounded. Admiralty – One of the first structures built in St. Petersburg. It also served as a construction site for some of the first ships of Russia’s Baltic Fleet. Nevsky Prospect – All roads of St. Petersburg lead to Nevsky Avenue, the main prospect of the city as well as a cultural, business, and trade center. Alexander Nevsky Lavra – Alexander Nevsky Lavra is a beautiful complex of churches dating back to St. Petersburg’s founding. At the turn of the 20th century there were 16 churches in the monastery complex (founded by Peter I). Five survive to this day: Holy Trinity Cathedral, the Church of the Annunciation, St. Lazarus’ Church, St. Nicholas’ Church, and the Church of the Holy Mother of God. Yusupov Palace – Built by Vallin de la Mothe in the Early Russian Classical style, Yusupov Palace is indeed a rare combination of various architectural monuments. Smolny Ensemble – Smolny Cathedral is certainly one of the most beautiful churches in St. Petersburg. Its astounding cupolas and baroque style architecture climb majestically above the Neva River. Bolshoi Okhtinsky – Built on over 100 islands, St. Petersburg boasts 539 bridges ranging from the very narrow pedestrian bridges to giant drawbridges like Bolshoi Okhtinsky. Piskariovskoye Memorial Cemetary – Five hundred thousand victims of the 900-day Nazi Siege of St. Petersburg are buried in this unforgettable resting place. Petergof (Petrodvorets) – The Palace-and-Park Ensemble of Petergof (Petrodvorets) is a jewel of the city. Referred by many as the Russian Versailles this town is an extravagant ensemble of parks, palaces, and fountains. Pushkin (Tsarskoe Selo) – The vast Palace-and-Park Ensemble of Pushkin (Tsarskoe Selo) is the former country residence of the Russian emperors. The newly renovated Amber room is also located in Petergof (Petrodvorets). Pavlovsk – This palace not far from Pushkin belonged to Paul I and his family. Pavlovsk is a magnificent example of Russian classicism. Lomonosov (Oranienbaum) – The Palace-and-Park Ensemble of Lomonosov (Oranienbaum) was founded by Duke Menshikov. The estate was originally called Orienbaum (German for orange tree) because Menshikov adored his vast orange orchard. Kronshtadt – This small city in northwest Russia is located on the small island of Kotlin in the Gulf of Finland. Founded in 1703 by Peter I as a port and a fortress to protect the site of St. Petersburg, it is one of the chief naval bases for the Russian Baltic fleet.